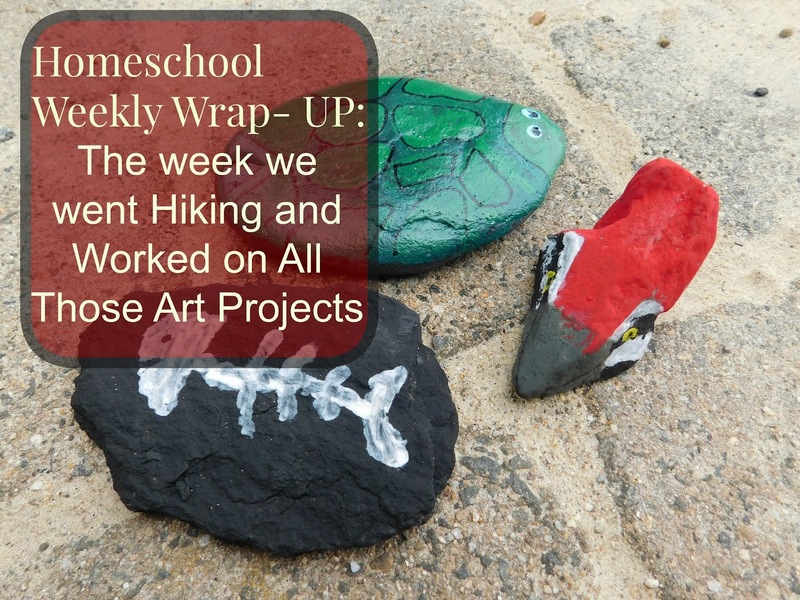 We had another fun and jam packed week! 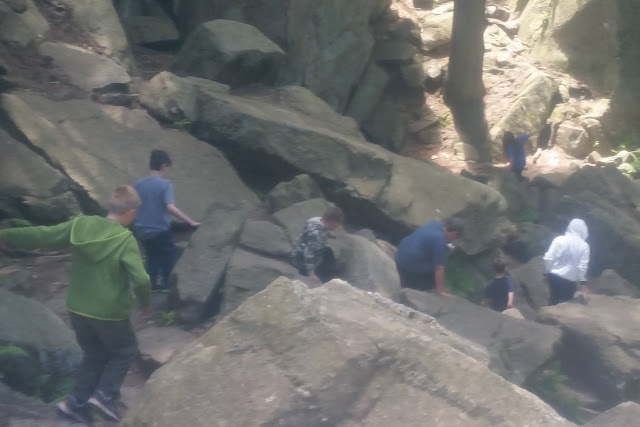 The weather has been pretty nice so we spent lots of time outside; mostly in our own yard painting, swimming, and playing but we did spent some time hiking and exploring nature too. Art: We used our art kits for some fun watercolor painting. You can read about the benefits of using art kits in your homeschool here and check out what comes inside these fun watercolor kits. You can purchase this fun dragon kit here. Alec and I painted some dragonfly silhouettes another day. You can check out our tutorial here. The boys all made pet rocks too! You can read all about how we made them here. History/ Geography: Ian, Alec and I played American Trivia. We watched Gods of Egypt recalling our knowledge of the Egyptian gods. Ian watched In the Finest Hours learning the real life story of the rescue of the Pendelton. Math: Ian and I played the Clumsy Thief. Evan finished up his Telling Time workbook in it's entirety on Monday and took the rest of the week off from working in math. Though we did use his Minecraft activity book and there were quite a lot of pages that dealt with word problems that we worked on together. Alec and Ian worked on two more pages in their math books each day as well as completing two more pages Are You a Math Genius and Multiplication games. We set aside Ian's Key to Percents book because he was so frustrated and started working on 6th grade review for the summer using this Brighter Child math workbook. Reading: Evan finished reading National Geographic Penguins, National Geographic Monkeys, read another few chapters in Miss Daisy is Crazy. Alec read A to Z Mysteries The New Year Dragon Dilemma and began read Treasure Hunters book 3: Secrets of the Forbidden City. Ian read A to Z mysteries Mayflower Treasure Hunt and started A to Z Mysteries White House White Out . We finished up the 39 Clues book 5; The Black Circle and Started reading book 6 In Too Deep. We finished up The Silver Chair; our book on Cd too. Science: We read Roger Tory Peterson's ABC of Birds, Into the Woods; John James Audubon lives his Dream, and The Bird House. We spent a lot of time looking at birds in our yard and out in the woods. 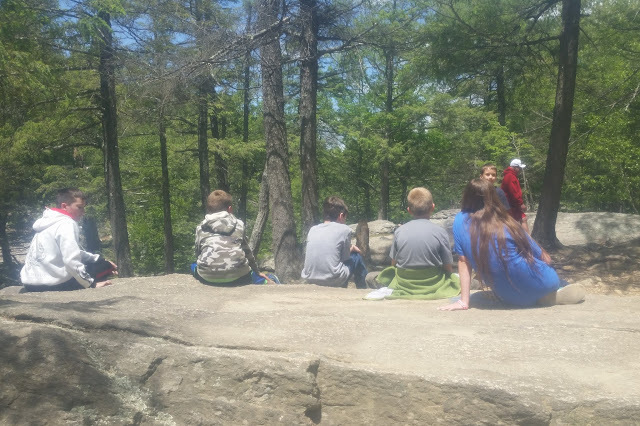 We saw a woodpecker on our hike and also noticed pollen deposits, butterflies, frogs, and the changes that a few thunderstorms had brought to our usual wooded trail. Health & Physical Education: Now that the boys are done karate for the summer we're trying to make a concerted effort to exercise each day. Monday we walked a local track and made it around 5 times. Tuesday we took an early morning bike ride, heading out just as soon as we finished breakfast so we could beat the heat. 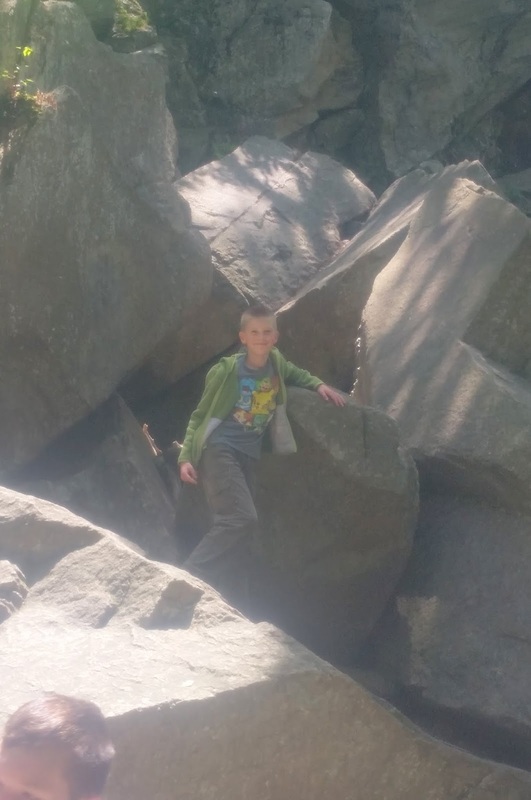 Wednesday we went on a hike and Thursday we met up with our homeschooling group to hike Purgatory Chasm; my boys LOVE this rocky hike where we climb up and down huge crevasses in the rocks. 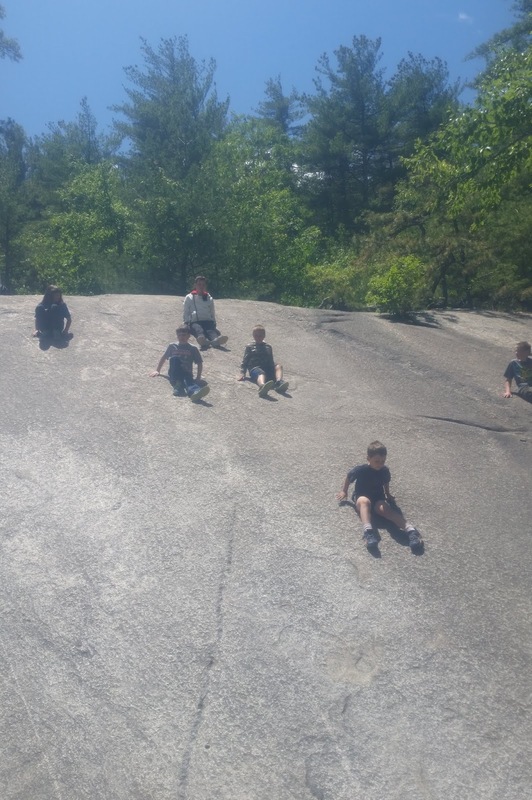 We always end our hike with the sliding rock; it's a tall smooth rock where the kids can climb up and then slide down. Look at the size of those rocks! The boys also spent most of the week swimming and playing in the water. Alec had a dentist appointment this week and learned a bit more about proper tooth care. Spelling and Language Arts: The boys all completed two more pages in each of their Spelling Tree books.. The boys also worked in their journals completing another Draw Write Now page. Socialization: We spent one day visiting with my grandmother. We met up with our homeschool group and spent a fun afternoon hiking and playing on the playground. It was a nice, relaxing, summer week of schooling for us. It has been the perfect week for hiking! Sunny with temps in the upper 60's and low 70's with a nice breeze. We decided we just had to take advantage! What a great week. Those rocks are huge. 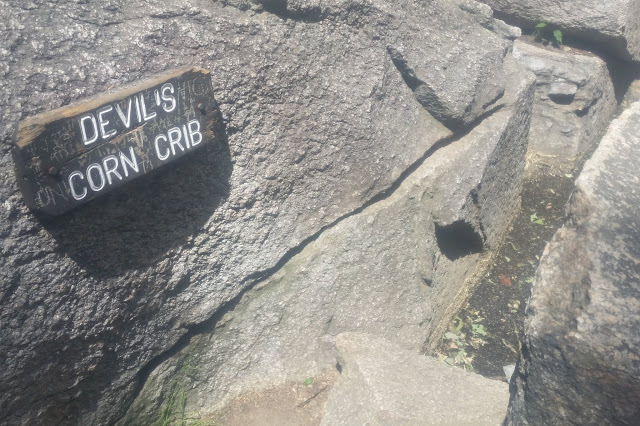 What a fun place to climb and explore. We try to get there a few times a year. It's unimaginable how huge they are! Yet I'm a wreck the entire time we're climbing. I am always so afraid someone is going to get hurt. Especially when we walk up and out of the canyon. I'm always so afraid someone is going to fall off the top. But it is so much fun and such great exercise that I try to put my fears aside. 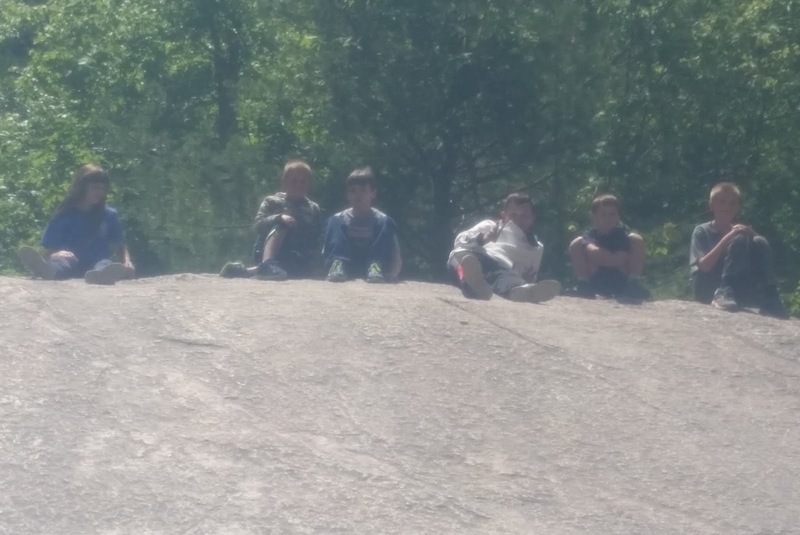 Wish I could have joined yall on that hike! Love the sliding rock!! That sliding rock is so much fun; we try to make sure they are wearing old & junky clothes because we have come home with holes a few times. I've even joined in a time or two; but the heights make me dizzy.